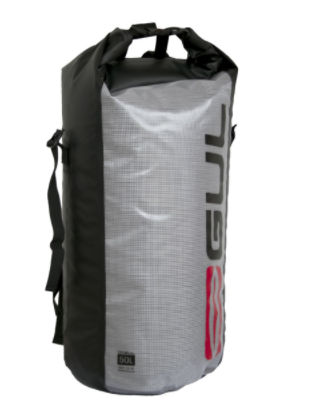 The 50L Gul backpack bag is ideal for a multiple of water sport uses, whether your storing your soaking wetsuit or protecting your dry clothes for later. Totally watertight and easy to open and close. The 50L Gul backpack bag has a sturdy construction in a cylindrical shape. The viewing panel and tough waterproof materials make it ideal for a multiple of water sport uses, whether your storing your soaking wetsuit or protecting your dry clothes for later. Shoulder straps allow you to comfortably carry your backpack around and snap shut dry fastenings mean the backpack can be opened and closed watertight with ease. A great companion for kayaking and kayak fishing. Bags can also be leashed to the boat to float alongside if you are pushed for space inside the kayak.